Here is a PART ONE recap of some of the goings-on at the 2014 ACDA Central Division Conference in Cincinnati last week. I could only be in town for the first few days- I had to leave Friday late afternoon to get back to Chicago and then Madison, WI for a performance in Madison of a big piece of mine by The Festival Singers, directed by my friend Bryson Mortenson. I was there early enough in Cincinnati to hear the opening night "Festival of Anthems" at Christ Church Cathedral. This was a wonderful program presented together by the following choirs: The Christ Church Cathedral Choir, directed by Stephan Casurella; The Cathedral Choir of Hyde Park Methodist Church, directed by Neal Hamlin; and the Xavier University EdgeCliff Vocal Ensemble, directed by my friend Tom Merrill as well as the Xavier University Concert Choir, directed by Richard Schnipke. These four choirs sang some great music interspersed by congregational anthem selections as well as readings by ACDA officers Tim Sharp, Mary Hopper, Loren Veigel, and Diane Hires (wow, Diane was choral director at my high school WAY BACK when I was a student and pianist there, not yet a choral person). I was very impressed by the Christ Church choir- I would assume that all or most of this choir are artistically devoted paid position singers. Everything they sang was spot on, as the Brits would say. Especially solid and artistic were the Parry "I was Glad" and James MacMillan's " A New Song". 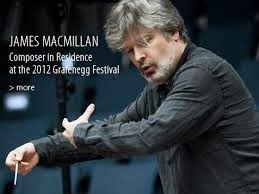 MacMillan needs to be FAR more known in the US- he is a major talent with a very personal voice. We need more choirs to begin recognizing his talent. 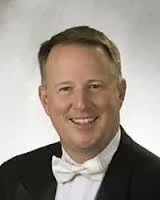 Actually Central division directors Tom Merrill and Nancy Menk have discovered him and brought him to the US for wonderful programs of his music. The selections by the Xavier choirs which were beautifully sung were the Josquin Ave Maria (Virgo serena) and the Purcell "Thou knowest Lord". I am again very impressed by the rock-solid artistry of Tom Merrill's singers and applaud the program he directs at Xavier University in Cincinnati. Congrats, Tom! The concert ended with a rockin' and rollin' postlude- the "Festival Toccata" by Arthur Banyon, performed by Christ Church's multi-talented Stephan Casurella on a pipe organ that had been a bit balky all night (cipher issues which we did our best to ignore!). All in all last Tuesday was a great opening night for ACDA Central. NEXT POST: more recaps of Central Division, even though I am now in Jacksonville for the ACDA southern division, and also did a ton of stuff in between these events- blogging and keeping up is a bear of a challenge! Text/Language; the tone of the text (sacred/secular? serious/ humorous? joyful/sad? modern or older in feel?) Length of piece; a cappella or accompanied; Voicing and potential vocal ranges, also key; difficulty level; length of piece; other issues. Paramount to all of this- does the text “speak” to you? Will it speak to others? Can you enhance the text's artistry through a choral setting? Will people be excited to sing it and will audiences be excited to hear it? In other words, what is your motivation as a communicator as you start composing? More text issues in particular: is it a commonly set text? What can you bring to it? If you are about to create the 4,937th Ave Maria- what might set your version apart!? Do you have something new to say? Piano accompanied settings: How involved is the piano? How well do you write for the piano? Should the piano double the voice parts- anywhere from never to always? [Give ex. of Janet Galvan's choral series]. Voicing/Key ideas: shall we avoid certain keys such as F, C, G, etc.? What ranges are we going to deal with? What tessituras make singers happy and how does key selection fit into this? Shall we be homophonic or contrapuntal? Shall we always let the sopranos have the melody? [PC: Give example of my most responded to FaceBook comment]. Copyright issues: The magic year of 1922. All works published prior to 1923 are public domain. To even begin to set a copyrighted post-1922 poem you must have written permission to set the text. You should also be requesting permission to perform and publish the work and create an agreement about the publishing scenario (one time buyout for use? ongoing royalty sharing?). Likewise, to arrange a piece of copyrighted music you must do the same as above prior to starting. also www.fairuse.stanford.edu Actually read the copyright law- it's quite short! What constitutes a copyrighted work when you compose or arrange [“set in final form”, “lifting the pen from the page”?]. What are the differences between composing a new work and creating an arrangement? What are your ides on this? One key question when arranging, do you have something original you can add; can you find a “hook”, or something else worth noting, that works for the arrangement? To me, arranging is an art and something more composers should be doing. It is also a great entry point for beginners! It can be very satisfying to take something already formed and reform it with your own voice and talents. Let's look at my arrangement of A City Called Heaven. This began because of my love for spirituals and my belief that they are an important part of our American musical heritage. I have arranged about ten spirituals for concert use and also included one in a recent large-scale work about the Civil War. My starting point for A City Called Heaven was a recording of the song by the famous African-American soprano Marian Anderson. Her version (with piano) is very straightforward. http://www.youtube.com/watch?v=OtA6tuEhwo4 To set it for choir I would have to come up with something very dramatic and something I could call my own as an arranger. This was an interesting project- it was four years from start to finish [explain why]. Opening- setting the dramatic scene- the hummed a cappella opening is full of deep sadness, loneliness and inner turmoil. The humming is what actually cannot be expressed in words. First verse- simple setting, unison and piano. The fermatas here and there are a definite element on the piece. They represent the sadness and turmoil- that nothing can progress without some sort of turmoil blocking the way. Second verse- a natural progression to two and three part writing (in stretto). Chorus: the first rising of high intensity dynamics, strong use of unison (and octave) sound, more fermatas which the choir sings through with intensity. This section explodes, especially with my hook for this section- the shocking A flat chord in the piano at mm. 49-50. Finding this harmony was what unblocked finishing this arrangement for me. It was something unique which gave the piece my signature and freed me up to become more creative as I continued working. Third verse- back to introspection. This becomes very personal for the textual voice. “My mother” painted in heavenly tessitura both for sopranos and piano; “my father” very dissonant for altos and piano. Then more sadness when sisters and brothers also are part of the abandonment. Final Chorus: same material as before but more complex, including more fermatas. The pause at m. 86 sets the stage for a very dramatic, yet quiet ending. There is a final, a cappella few measures of music which is actually new material as far as harmonies go (my “create something a bit new at the ending” mantra). The song finally ends with some rather ghostly harmonies on the word “home” which closes to a hum and thus connects to the very beginning. The singers sing all the way through to the end (another mantra- “keep your singers engaged” as close to the end as possible). This piece has had many performances- I think for two reasons. It is very dramatic- it's impossible to not connect to the drama and pathos of this text when sung well. It's also a rarity in that it is a spiritual set specifically for women's voices, not just an SATB setting rehashed for women. score samples in some form- whether in part or full- online, paper, etc. getting started: can you actually get to hear your music besides a Finale playback? Enlisting friends, colleagues, your professors, street people, etc. learn some counterpoint- you'll be unique! attending ACDA conferences (NafMe, AGO, Kodaly, etc. conferences) What else can you learn there? is it schmoozing or networking? Your view of publication: does publication through various mainstream publishers prove the value of your work? What do you think? Publish through mainstream publishers? Only “self-publish? Do both? What are the pros and cons to this whole situation today? Back it up: how do you publish with mainstream publishers???? are you willing to give up control of your copyrighted piece? Are you willing to do that for a return of 10% of the selling price? Can you call some of the shots about how this happens? Goofy stories about the publishing world [anecdotes about Oxford and James, and Reg, missing scores, POOP (Permanently Out of Print), etc. what are realistic sales goals? Can you make a full-time living as a “classical” composer today? (I view my 10% royalties from publishers as a promotional item, in other words, even though I resent the low royalty rate, I consider them as my hired help for publicity). Conclusion: If you think you have something to say to the world through your music, go for it. It sure as heck will be an interesting life! Doing this part-time makes a lot of sense, but that doesn't mean you can't be artistic, serious, and proud of your work.